The 1838-C Classic Head Quarter Eagle was the first coins from the Charlotte Mint. On August 1, 1834, the weight of gold coins was reduced in the effort to stop the exportation and melting of coinage. Profiteers were taking advantage of the relatively heavy gold content in US coinage and wiped out much of the supply of quarter eagles and half eagles. Coinciding with the new standard was the introduction of the Classic Head Quarter Eagle. The work of Mint Engraver William Kneass, Lady Liberty wore a head band inscribed with the word “LIBERTY”, rather than a cap. The Classic Head Quarter Eagle was in production only until 1839, when it was replaced by another style to match that of larger gold coins already in circulation. 1838 was the first year of production at the nation’s first branch mints in New Orleans, LA, Dahlonega, GA, and Charlotte, NC. During the first year of operation, a very small mintage of 7,880 quarter eagles came out of Charlotte, and is one of only two Classic Head Quarter Eagles struck there. The 1838-C is also characterized by the mintmark on the obverse, just below Liberty’s neckline. From the 1860’s onward, the 1838-C Classic Head Quarter Eagle has attracted the interest of branch mint gold specialists and other coin collectors. Fewer than 100 examples are estimated to exist, meaning the supply is extremely limited relative to demand. The 1838-C Quarter Eagle is a true rarity for the ages. 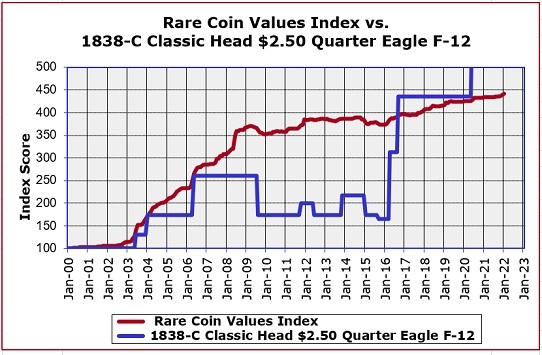 For a truly rare US gold coin, the 1838-C Classic Head Quarter Eagle appreciates in value rather modestly, at least since the Year 2000, which is the baseline for our Rare Coin Values Index. The blue line charts the percent increase of the 1838-C in F-12 condition. The red line illustrates the percent value increase of the Index over the same time period. The Index is comprised of 87 rare United States coins chosen to represent the spectrum of regular issue United States coins. The objective of the Index is to get a feel for the strength and direction of the overall US rare coin market. The 1838-C Quarter Eagle is one of the 87 coins tracked in the Index. All data is updated monthly.